This week may prove to be a busy one, with four recalls announced first thing this morning. The holiday season usually brings tins of butter cookies, but not for Rite Aid. Rite Aid has initiated a voluntary chainwide recall of approximately 85,000 tins of butter cookies, distributed by Rite Aid under the Rich Fields brand name, due to the possibility that they may be contaminated with Bacillus cereus. This microorganism may cause diarrhea, nausea and/or vomiting; however, the possibility of serious adverse health consequences is minimal. This recall affects only the 12 oz. tins that feature either a decorative castle or Christmas designs, and sold exclusively in Rite Aid stores. Affected butter cookies can be identified by the UPC codes 01249596519 and 88411804619. The recall was initiated after the company conducted quality testing on the affected product because of an uncharacteristic odor. No other Rich Fields or Rite Aid brand products are affected by this voluntary recall. Second recall for the day is Eating Right’s Soy Protein Burgers. The packages inadvertently contain Eating Right™ Veggie Burgers, which contain milk. The label does not list milk as an ingredient. People who have allergies to milk run the risk of serious or life-threatening allergic reactions and should not eat this product. There is no concern for those who are not allergic to milk. The retail package is a 4-count, 10-ounce carton marked with a UPC Code of 79893 80071 and one of the following lot codes on the side panel of the package: NOV 17 12 WT A or NOV 12 WT B. This product is located in the freezer case. No other Eating Right products or date codes are involved in this recall. Safeway was notified of the situation by a consumer. Rhythm Superfoods voluntary recall of KOOL RANCH KALE CHIPS is number three for the day. 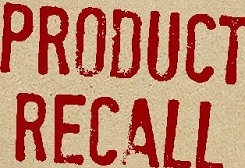 The recall was initiated after it was discovered that approximately 2,700 cases of the Kool Ranch Kale Chips containing cashews were distributed in packaging that did not reveal the presence of the cashews. Subsequent investigation indicated that the problem was caused by the use of new packaging that failed to declare the cashews. People who have an allergy, or a severe sensitivity to cashews, run a risk of serious or life-threatening allergic reaction if they consume these products. To date, only one case of allergic reaction has been reported.